What types of messages are most persuasive? For example: would you be more likely to buy a TiVo if an ad described it as offering you freedom, or if it explained how you could replay sports events? Whether shoppers are more persuaded by abstract or concrete benefit information depends on their goals. 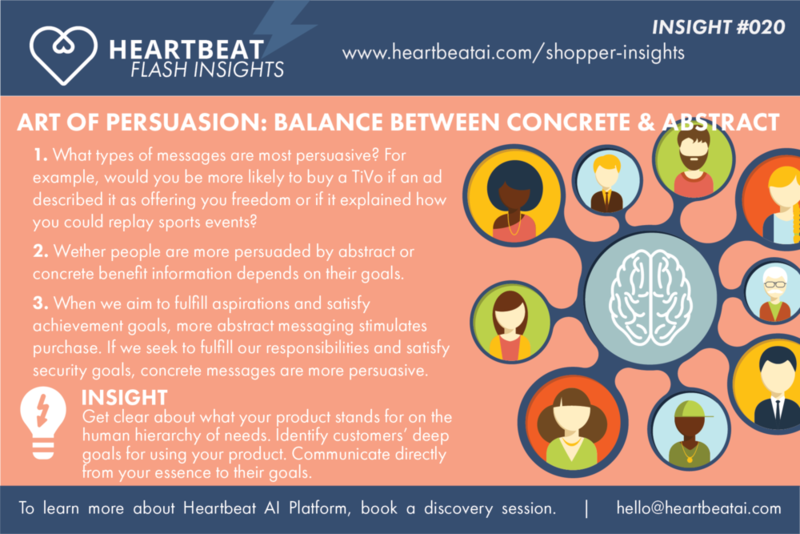 When shoppers aim to fulfill aspirations and satisfy achievement goals, more abstract messaging stimulates purchase. For shoppers who sought to fulfill their responsibilities and satisfy security goals, concrete messages were more persuasive. Get clear about what your product stands for. Identify shoppers’ goals for using your product. Communicate directly from your essence to their goals.